Let's just use Juan tier list and work to vote from S like what Void propose. Either "Keep", "Go down" or "Go Up"
hell, ssj as well. his intellect was able to more than keep up with ytw for the majority of their battle. With Juan's list it's alright but I can't help but notice we lost a good amount of characters off the tier list, and some are already a bit questionable. For some reason I'm not really seeing what puts a defensive specialist like Rihaku in the bottom bracket with Rinbou while Batei who is a sub-par muscle without a brain is a tier ahead of him and I'd favor him for his tactical abilities over Maron in most circumstances unless the situation would really benefit from a bandit with a decent head on his shoulders. Honestly there are situations where I'd take any of the Bayou boys bar Kousonryuu over Kisui, not because they're better, but because they have more specialized utility with Shoumou's destruction and martial, Rihaku's defense, Mangoku's assault, and Fuuki's brain over the others all-roundness. Gakuei is more along the lines of the sort of fighter I'd expect for Tier C.
it's just a rough list made to have a start. it's not perfect, and i welcome the questioning. Let's just start the voting first for S tier and we can go down from that. Did I read this right, Gyou'un and SSJ are better than Keisha? but no... i said there's a level of parity between them, and kei sha. "parity" meaning the state or quality of being equal. in other words they're comparable. 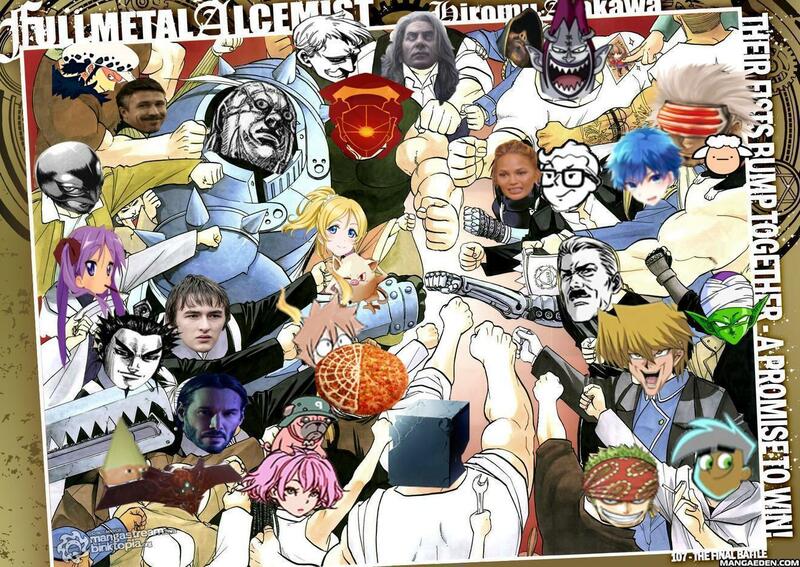 and i said this was the forums general consensus based on versus threads they're pit against each other in. which is what matters right, zentos? not what we personally think, right? You said it in the same breath together with being above Earl Shi and Gaimou, another fallacy, it's not my fault you decided to put them back to back. And no, no idea who but you would put Keisha on their level, especially not when people gave Keisha the benefit against Bananji and SSJ together. You're out of touch with reality. Keisha was the closest and only one to be close to the 3GH, and no one else. Everything else is your fanfiction, and certainly not what KP thinks. i think we could add kyou to s tier, and add hakuki to s too? maybe add rozo to A? or B, perhaps? That's a lot of guesswork though. Could view them as Ytw and Ousen, I guess. I value Keisha more than Gyou'un but ultimately there's going to be a lower end and a higher end on each tier, the main part is just making sure the disparity is not too great within individual tiers. ousen is a copy of hakuki, so other way around. kyou we don't need to assume much. and rozo is a mountain king that doubles as a brute. he's a kaishibou, just a bit stronger. Last edited by Cichy; 02-11-2019 at 04:55 PM. it's really not my fault that you apparently don't understand the purpose of punctuation, or the meaning of certain words. unless you also believe that kei sha's "closest to 3gh hype" even puts him above the likes of shi ba shou, then it should really stand to reason that he and gyou'un simply weren't contending kei sha for the spot since they were essentially both retired from the front lines. and like i said, versus threads tell that kp's general consensus is that these guys aren't far apart. actually agree. didn't change everyting about crispy's list because i wasn't trying to pass this off as a final list. zen ou's hard to peg so wasn't sure where he should go exactly, but tier captain does sound fair. Except Shibashou was already offered the position, Gn was kind enough to explain that one to you already. Interesting conclusion regarding those threads, but we'll leave it at that. I agree with a S- tier. Will take a look later. I wanna downgrade the bolded to S- tier. What do you guys think?